This clever bottle presses fruit for a flavorful, delicious infusion. A slice of lemon brings water to life. But we'll let you in on a secret: Pomegranate, orange, blueberry water is like drinking a summer's day. 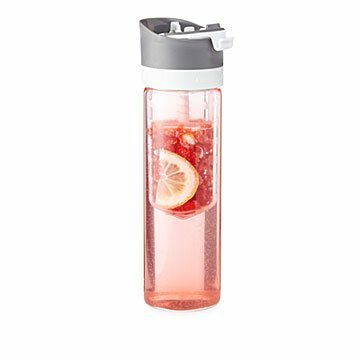 This unique bottle lets you squeeze fresh fruit into water without getting your hands sticky. It has a nifty compartment that presses and holds your favorite infusions like lemon and lime. Experiment with new flavors—pineapple and mint, basil and pomegranate—without fear of swallowing a whole leaf or piece of fruit. A fun way to enjoy delicious flavors without adding sugar, it makes a great gift for juice lovers or foodie friends (foodies need to hydrate, too!). Made in China. 10.5" H x 3.1" Dia. Great gift for a friend. Add-on birthday gift for my mom. Thought it would make drinking more lemon water and fruit-infused water convenient. Best tasting water I have ever had!